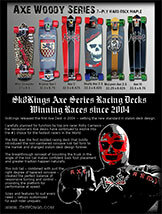 Dual wheelbase: 18.75" & 19.75"
Lynn Kramer - is the 12-time Women's Slalom World Champion as well as a multi-world record holder in the Women's 100 Cone -- and her signature model is her go to choice for tight and hybrid slalom. 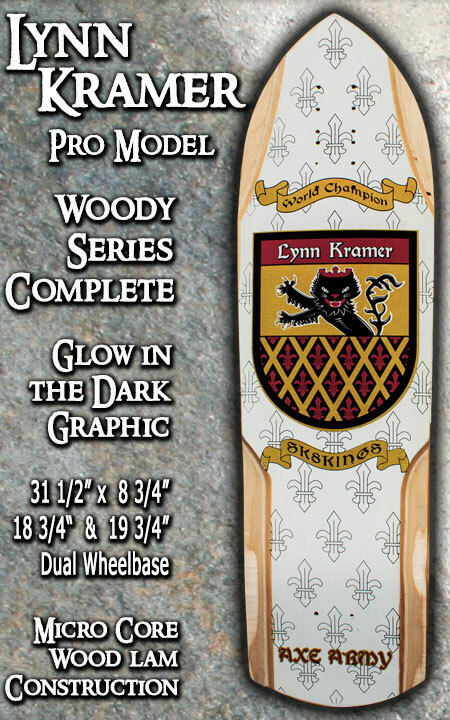 Order your Lynn Kramer Woody Complete ready to race out of the box. Loaded with select quality components -- the Kramer complete is an excellent choice for new racers -- taking the guesswork out of proper equipment choice/setup and shorten the learning curve. The Lynn Kramer Complete is sized for tight turning at speed and is ideal for tight and hybrid slalom. Can also be set up as a street cruiser by moving the truck location in rear and adding a tail skid plate (option available upon request -- not pre-drilled). Check out some video of Lynn setting the Women's 100 Cone World Record - riding her Kramer Pro Model. CUSTOM BUILT FOR YOU: Specify rider weight when ordering AND what discipline you intend to ride the most (ie - racing hybrid/GS or a non-racing application) so we can use the correct wheelbase and dial all components accordingly.